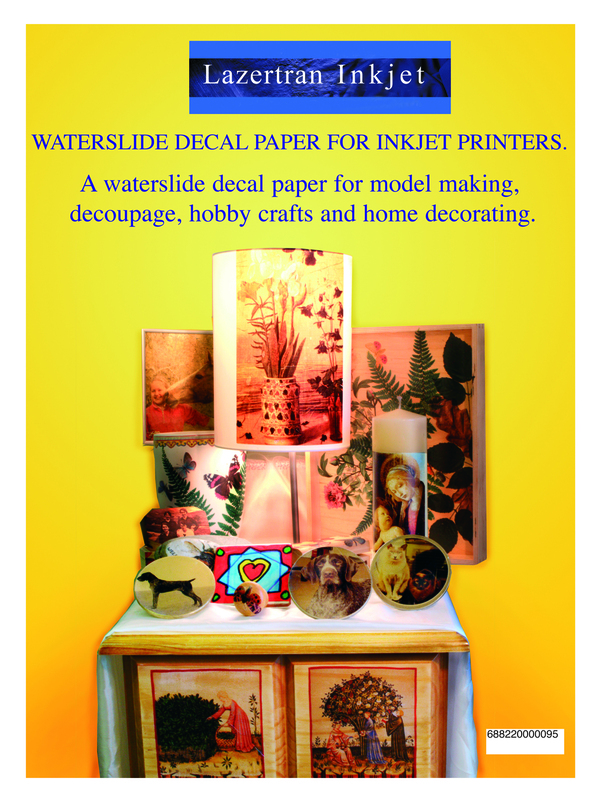 Instructions for Using Lazertran Inkjet Waterslide Decal Paper. This special transfer paper allows you to transfer images using your computer inkjet printer. N.B. It is not suitable for transfer to cloth. For this use lazertran Inkjet Textile paper. 1.Print your image on the smooth, chalky white side of the paper. Not use too much ink and click off any high speed options. 2.Allow to dry for 30 minutes. 3.Cut to size, soak in water until the decal releases, (about 60 seconds). For smooth non-absorbent surfaces such as glass, ceramics, plastic and metals there is enough gum on the back of the decal to give good adhesion although a little (methylated spirits) alcohol on the receiving surface improves adhesion. For more absorbent surfaces such as wood then use the method below. Using real Turpentine to melt the decal to the surface. 1.Paint the wood etc with a good coat of real turpentine (white spirits or any substitute will not work). 2.Apply the decal onto the turpentine painted surface image side upwards and carefully remove any air bubbles. 3.Leave to dry for several hours. The decal will dry with a white background. 4.To finish apply a few coats of any oil/spirit based varnish to protect and make the decal transparent. 5.It you wish the decal to remain white then apply and water-based varnish.